This thing is incredible! Unlike other clubs, this club was designed by native americans to be an amazing weapon. The curve is pretty big, but this makes it better, due to the superior momentum it can recieve. The blunt spike can be easily screwed/unscrewed, but its no joke. Overall, this weapon can smash cinderblocks, bricks, and almost anything else in its way. Very sturdy. A tad lighter weight than I expected but really ideal. It would hold up under the most strenuous use and I'm glad to have it under my bed. this thing is one of the most badass things ever. it had a great forward force/weight thats devastating with the arc, this thing does take out cinder blocks like nothing. 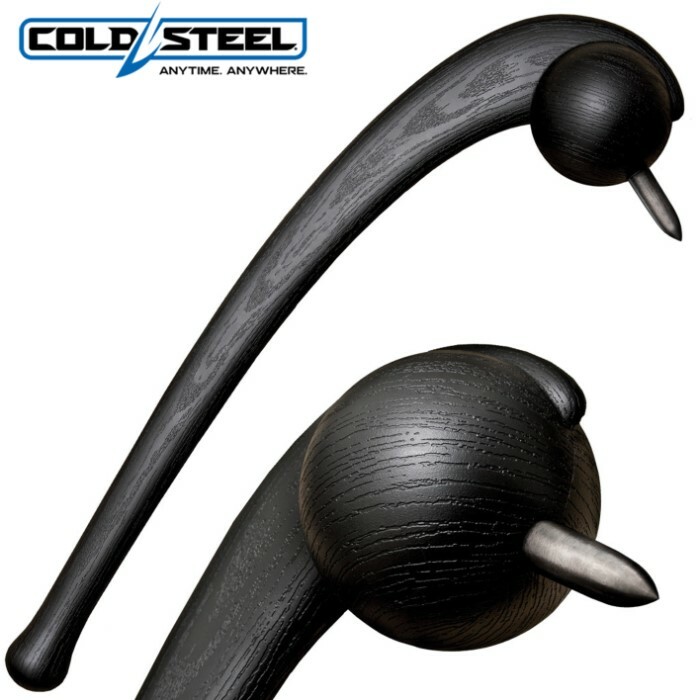 very very pleased with cold steel products and trueswords amazing low prices. dedz to trueswords! So I love this thing. It is more robust than I thought based on the pic. It fits well and feels comfortable in the hand. It is a powerful self defense tool. It is easy to swing and has explosive force. The arc that leads into the heavy ball which holds the steel blunt spike is a formula for destruction. The fact that it is a modern version of a Native American weapon only adds to its charm. Lastly the price here at true swords is the best I have found for this item anywhere. I looked. Kudos to True Swords. i originally didn't know if i should buy this or not considering there were no reviews on it on any site, but i ordered it anyways and im glad i did. Just holding it you could feel the power of this weapon and after smashing random things from avocados to coconuts i can tell you this would be an extremely effective self defense weapon.